MIAMI EVENTS BAHRAIN brings you the most remarkable party of the new season, "Bahrain Reggae Beach Festival" 15th of March, Friday! 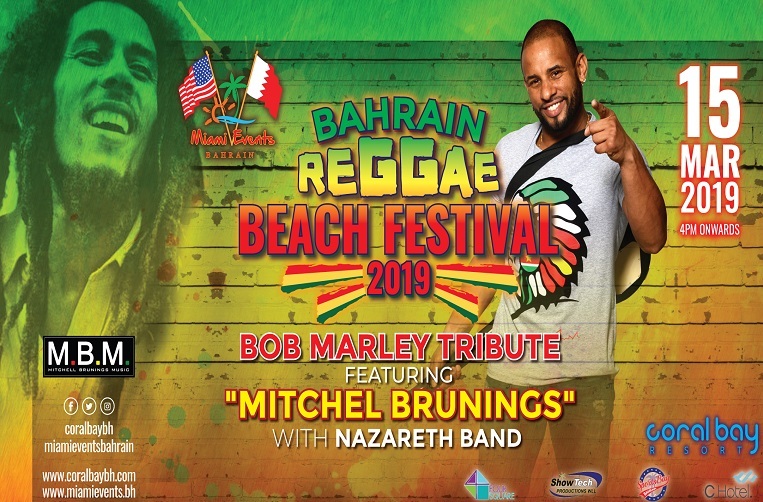 Tribute to king of Reggae, Bob Marley featuring the voice of Holland " Mitchel Brunings" with Nazareth Band. Mitchel will be performing live with his band for the first time in Bahrain to throw down a smokin reggae classic, his soulful, gorgeous voice and deep respect for Bob music and life make him perfect fit for this event. Mitchel gained worldwide attention in 2013 when his soulful rendition of Bob Marley’s Redemption Song during his audition on Holland version of popular singing reality show THE VOICE went viral. Mitchel has gone on to tour worldwide, often covering his idol song. Mitchel now brings his voice and music to stage around the world. Catch him LIVE & enjoy the most anticipated show in Bahrain only at the Island favourite Resort "Coral Bay" . Just show your coupon at the event and enjoy!